We have another recall the tell you about. This one involves medicine you might have at home. Tris Pharma, the maker of the store brands of infant ibuprofen from Walmart, CVS and Family Dollar, is voluntarily recalling three lots of the medicine. The company says the concentration may be too high and infants may be more vulnerable to permanent renal injury. 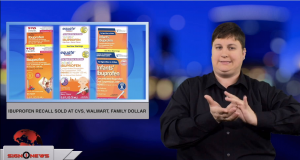 The brands of infant ibuprofen concentrated oral suppression are Equate from Walmart, CVS Health and Family Wellness at Family Dollar. If you have one of those, go to www.trispharma.com to see if it is included in the recall.